Do you need some writing lessons that encourage your students to move beyond the simple sentence phase and into building better sentences by adding details? When details are clear and specific it paints a vivid picture in the reader's mind. Details in writing will help it be more Interesting, Important, and Informative. This pack that I created has many ideas that will help and show students how to include effective details in their writing by using sensory words, colors, emotions, descriptions, and answering questions like who, what, when, where, and why. I always tell students it's not how many details you have, it's the quality of your details that makes your writing stand out. You can find this poster in my Writing Details pack posted below. The brown dog sits quietly on his bed. Students can also turn this sentence into other sentences. For example: Does the brown dog sit quietly on his bed? or That brown dog is sitting quietly on his bed. Download this FREE example and writing paper to try this lesson today. 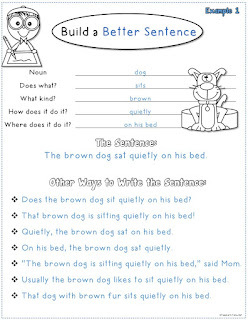 Here is the pack of Writing Details with more build a sentence and so much more. 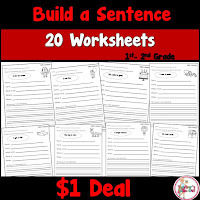 It is loaded with over 50 pages of worksheets, ideas, and writing centers to get your students writing more details in their sentences. They can do this by building better sentences, using their sensory feelings to write details, or describe people, places, and events using a checklist. This pack has so much in it. Your students will have plenty to work on all year long. There are many writing centers, lessons, and worksheets to improve in detail writing. Check out the PREVIEW to see this pack up close. Click the picture on the left to read more about it. This pack is perfect for 2nd and 3rd grade classrooms. l also have a pack for beginner or younger students just learning about adding details. This is a pack of 20 repetitive worksheets that students change one sentence into a better sentence by building onto it. This pack will improve their sentence writing and improve adding details to their writing. 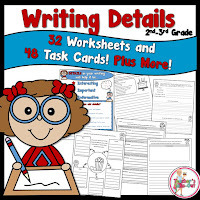 This pack is perfect for beginning writers or 1st and 2nd grade classrooms. These worksheets can be used for a quick writing lesson, for a warm-up activity, as an exit ticket, or place them at a writing center to keep kids practicing throughout the year. Enjoy the free lesson on writing better sentences. You can also find all my products right here on my blog at a discounted price. Click the picture on the left to see more.